The family of an Afghanistan veteran who killed himself say the Ministry of Defence is ­failing Britain’s troops – as the ­nation comes together for Remembrance Sunday. Relatives of Private Reece Miller, who shot himself in front of his ­comrades, reacted angrily after the Sunday People discovered there are NO serving military psychologists and only a DWINDLING band of serving ­military psychiatrists. The armed forces are also short of military GPs – often the first medical professionals to spot post-traumatic stress disorder in troops. And the number of serving mental health nurses has fallen. Former military chiefs also expressed alarm at our findings. Under Freedom of Information laws we discovered the MoD had four ­psychologists five years ago but they left and not one has been replaced. Over the same period the number of military psychiatrists has dropped from 19 to 14. The armed forces are short of 57 GPs and 234 regular and 518 reserve nurses. The number of regular mental health nurses has fallen from 120 in 2011 to just 85 this year. Critics say forces chiefs have become over-reliant on the contribution of ­reservists, who already have busy lives in today’s overstretched NHS. In the last ten years more than 23,500 service personnel needed mental health treatment. The MoD figures have outraged the family of Reece, 29, who took his life during a training exercise in Estonia in July. Kerry, 31, said: “In my opinion ­soldiers should be getting access to a counsellor at least once a month. There should be mandatory psychological tests. No one is invulnerable. Reece shot himself in front of his platoon. “Something must have been very wrong yet nobody noticed anything. I find that hard to believe. “Most people who take their own lives do it privately but Reece did it in front of all his friends. Reece had served in the 1st Battalion the Yorkshire Regiment for nine years and endured a tough tour in Afghanistan in 2011-12. Two comrades who Reece knew personally were shot dead by a rogue Afghan policeman at a checkpoint. 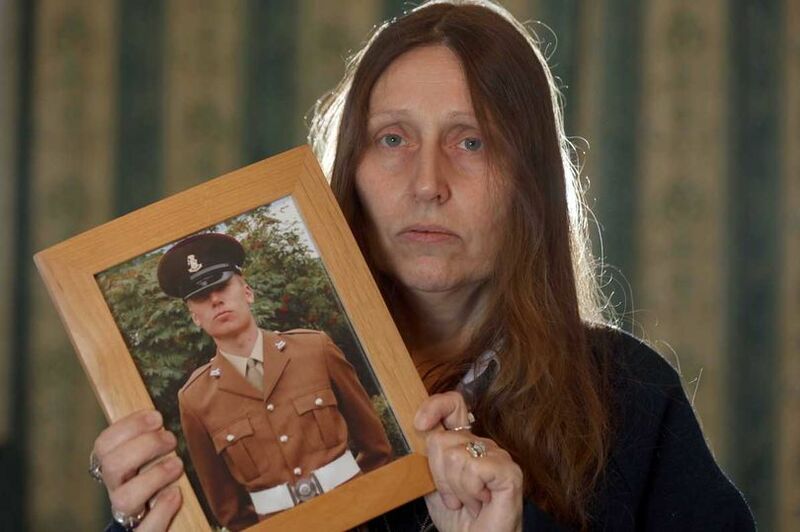 Mum Jackie, a bus driver from Huddersfield, West Yorks, said: “Reece had become friendly with the Afghan and was at the ­checkpoint minutes before his comrades were killed. But he never spoke about this to me. “I suspect that would have been something very difficult to cope with. Jackie added: “I’m speaking out because I don’t want anyone else to go through what my family has been through. “I want something good to come from Reece’s death. The Government needs to be held to account for all of these soldiers and veterans taking their own lives. Former head of the Army General Lord Dannatt – who backs the Sunday People’s Save Our Soldiers campaign to improve PTSD treatment – says the MoD is “papering over the cracks”. Lord Dannatt said: “Recruitment into the Defence Medical Services has been a major struggle since the 1990s decision to close all military hospitals. “While this decision was logical based on the reduced military patient population, it deprived Defence Medical Service personnel of living and working in the unique environment of the Army, Navy and Air Force. Former head of the Armed Forces Lord Richards said: “These figures are extremely worrying. Faith in our medics is at the heart of high combat morale and military effectiveness. Colonel Glynn Evans, chairman of the British Medical Association’s Armed Forces Committee, said: “It is extremely concerning. “Our servicemen and women are all taught to recognise signs of mental ­ill-health in themselves and others and to raise it. “But there’s no point in them raising it if we can’t deliver the care they need. Key to that are mental health workers, psychiatrists and psychologists. The Sunday People’s Save Our Soldiers campaign is calling for a radical shake-up over the ­handling of PTSD. Our investigation also revealed a serious shortage of specialist doctors and surgeons in all areas such as ­orthopaedics, plastics and burns plus anaesthetics. Today a Ministry of Defence spokesman said: “We remain ­committed to ensuring we have the right skills at every level and in every field of the armed forces and we have a range of ­initiatives to make sure we attract and keep the people we need.